Prunus laurocerasus is an evergreen shrub or tree that grows to a height of 15 metres. Native to areas of the Black Sea, south-eastern Europe and south-western Asia, it is also known as the common laurel, cherry laurel or English laurel. Prunus Laurocerasus produces dark green, shiny, leathery leaves, racemes of white flowers and dark berries and is frequently used for hedges and in gardens. 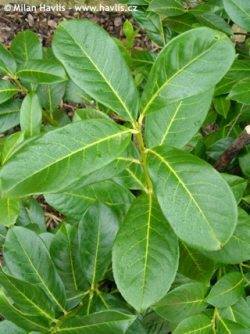 Its leaves smell like almonds when crushed and are favoured for laurel wreaths. The homeopathic remedy, Laurocerasus (Laur. ), is prepared from the leaves of the plant, and is frequently used during cardiac or respiratory disorders with coldness, collapse, low vitality and weakness. The patient may intensely sleepy to the point of coma and have lack of reaction. It is also indicated in cyanosis (blueness) of newborns, especially when the above symptoms are present. When the remedy matches the symptom profile, Laurocerasus has the ability to treat conditions such as congenital heart disease, congestive cardiac failure, coma, cyanosis, and pneumonia. Dulness of the senses ; inability to collect one’s ideas. Insensibility and complete loss of sensation. Weakness of mind and loss of memory ; fear and anxiety about imaginary evils. Loss of consciousness, with loss of speech and motion. Stinging and tearing in the limbs. Painless paralysis of the limbs. Want of energy of the vital powers and want of reaction. Epileptic convulsions, with foam before the tightly closed mouth. Amelioration at night and in the open air. Weakness of mind and loss of memory. Inability to collect one’s idea. Fear and anxiety about imaginary evils. Acts on brain and spine, especially upon the medulla oblongata ; hence characteristic tetanic spasms of the upper part of the body, gasping breathing, etc. Suffocative spells about the heart, < sitting up, > lying down; cardiac cough; gasping, twitching and jerks. Lack of re-active power, low vitality, with blueness or cyanoses, especially in heart troubles. Drink rolls audibly down through the œsophagus and intestines; very low pulse.